FiberLAN is the most cost effective, efficient and environmentally friendly alternative to existing copper based Ethernet Switch LAN infrastructure available in the market today. FiberLAN is a high-performance, high density GPON based Optical LAN solutions (OLS) delivering high speed data, voice and video to multi-level, multi-unit commercial and industrial complexes, including hotel rooms, bandwidth demanding desktops and work-stations. FiberLAN can deployed in offices, rooms, factories or other industrial harsh environments, delivering comprehensive connectivity for any Local Area Networking requirement – today and in the future. Zhone FiberLAN is a next generation Optical LAN Solution built entirely on industry leading standards. This fully converged solution is scalable for a single or multilevel buildings, or large campus environments where customers are installing new facilities or upgrading their current LAN infrastructures. Designed as a layer 2 transport medium, Zhone FiberLAN delivers converged voice, video, and data services, at Gigabit levels to the end user, over a single strand of fiber; thus reducing your LAN infrastructure cabling and electronics to a fraction of what is required compared to a conventional Ethernet LAN solution. As technology advances, so do ways to conserve energy and reduce operating costs. 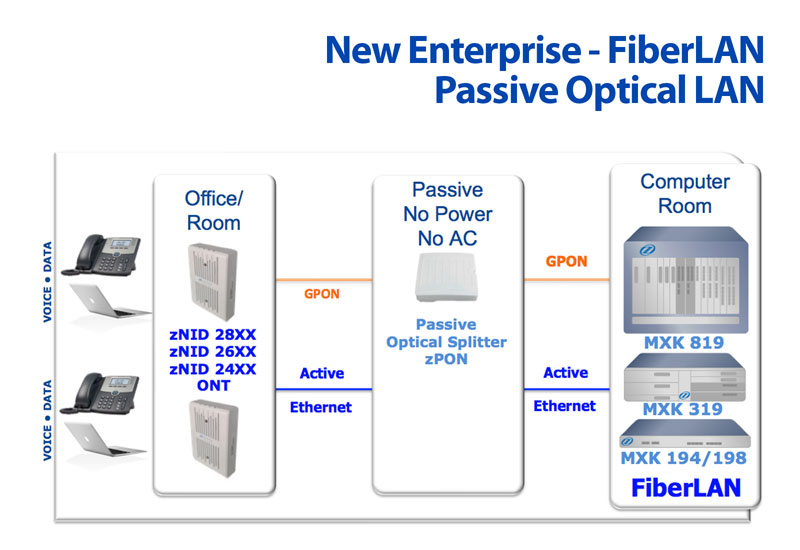 FiberLAN Optical LAN Solution replaces conventional copper and multimode cables used with traditional network infrastructures to a single mode fiber optic cable allowing you to eliminate the traditional workgroup switches, patch panels, and racks in the riser closets.